1. Visually inspect to make sure that there are no cracks, scratches or other damage. 2. Use liquid penetrant tester on the important sections to check for fissures. 3. Check that there are no marks of gas leaking or water leaking on gasket attachment surface. 4. 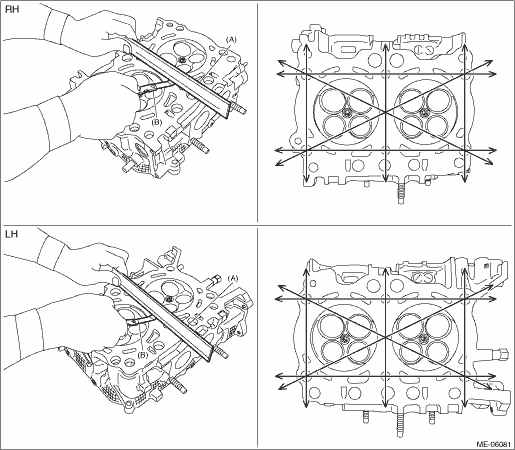 Check the warping of the cylinder head mating surface that mates with cylinder block at the locations shown in the figure using a straight edge (A) and thickness gauge (B). If it exceeds the limit, correct the surface by grinding it with a surface grinder or replace the cylinder head. • Measurement should be performed at a temperature of 20&#x00B0;C (68&#x00B0;F). • If there is warpage on the cylinder head mating surface, the cylinder head bolt tightening torque and angle tightening may be improper. When installing the cylinder head, make sure that tightening torque and angle tightening work is performed precisely according to the operation procedures. 1. Check the valve flange and stem for damage, wear or deformation. 2. Measure the thickness “H” of valve head edge as shown in the figure using a caliper gauge. If it is not within the standard, replace the valve. • It is possible to differentiate between the intake valve and the exhaust valve by their overall length. 3. Check the clearance between valve and valve guide. Check the clearance between valve and valve guide by measuring the outer diameter of valve stem and the inner diameter of valve guide respectively. (1) Measure the outer diameter of valve stem with a micrometer. If it is not within the standard, replace the valve. • Measure the outer diameter of the valve stem at the six locations as shown in the figure, and read the value of most worn location. (2) Using a caliper gauge, measure the inner diameter of valve guide. If it is not within the standard, replace the valve guide. For replacement procedure, refer to step 4). • Measure the inner diameter of the valve guide at the six locations as shown in the figure, and read the value of most worn location. (3) Calculate the clearance between valve and valve guide. 4. If the clearance between valve and valve guide exceeds the standard, replace the valve or valve guide, whichever shows the greater amount of wear or damage. For replacement procedure of valve guide, refer to the following. (1) Insert ST into the valve guide with the combustion chamber upward and remove the valve guide using plastic hammer. • Place a wood board wrapped with a waste cloth to stabilize the cylinder head before work. 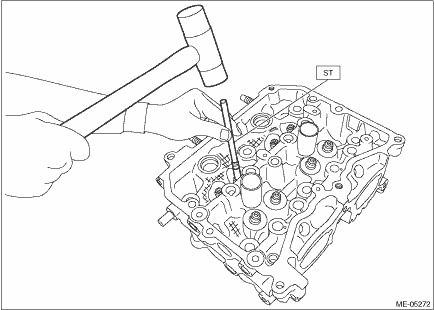 • Use special care not to damage the cylinder head during work. • Always strike the ST vertically with a plastic hammer. Otherwise, the ST can be damaged. (2) Before installing the valve guide, make sure that neither scratches nor damages exist on the inner surface of valve guide installation holes of cylinder head. 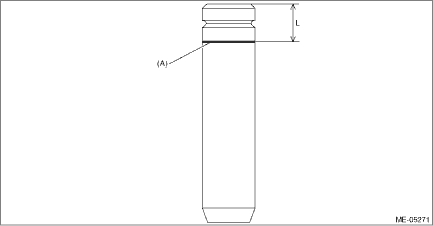 (3) Draw a reference line (A) for insert on the valve guide using a marker as shown in the figure. • Use a new valve guide. • A reference line for insert is used as a guide when tapping-in the valve guide. (4) Apply a enough coat of engine oil to the valve guide, and set the valve guide on the cylinder head with the combustion chamber downward. (5) Insert the ST into the valve guide, and tap-in the valve guide to the reference line (A) for insert using plastic hammer. • During work, place a waste cloth, etc. to avoid scratching the mating surface of the cylinder head. 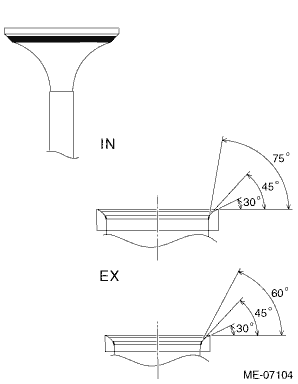 (6) Measure the valve guide protrusion amount “L” as shown in the figure using a caliper gauge. Insert the ST into the valve guide again, and tap-in the valve guide so that it is positioned within standard by referring to the measured value using plastic hammer. Be careful not to tap-in excessively by repeating the steps of Tapping-in > Measurement > Tapping-in > Measurement … when installing the valve guide. (7) Ream the inside of valve guide with the combustion chamber upward using the ST. Put the ST in valve guide, and rotate the ST slowly clockwise while pushing it lightly. Bring the ST back while rotating it clockwise. • Apply engine oil to the ST.
• If the inner surface of valve guide is damaged, the edge of ST should be slightly ground with oil stone. • If the inner surface of valve guide becomes lustrous and the ST does not chip, use a new ST or remedy the ST.
(8) After reaming, clean the valve guide to remove chips. 1. Visually check the valve shim for damage. 2. Check the clearance between valve and valve shim. Check the clearance between valve and valve shim by measuring the outer diameter of valve stem end and the inner diameter of valve shim respectively. (1) Measure the outer diameter of valve stem end with a micrometer. If it is not within the standard, replace the valve. • Measure the outer diameter of the valve stem end at the two locations as shown in the figure, and read the value of most worn location. (2) Using a caliper gauge, measure the inner diameter of valve shim. If it is not within the standard, replace the valve shim. • Measure the inner diameter of the valve shim at the two locations as shown in the figure, and read the value of most worn location. (3) Calculate the clearance between valve and valve shim. If the clearance exceeds the standard, replace the valve or valve shim, whichever shows the greater amount of wear or damage. 1. Check the valve seat for damage and deformation. 2. 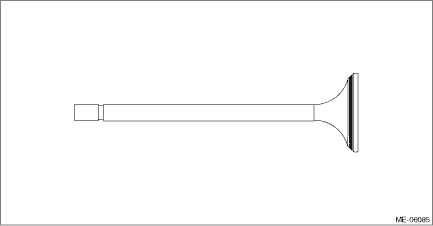 Check the seating width and seating position between valve and valve seat for the intake valve seat and exhaust valve seat. 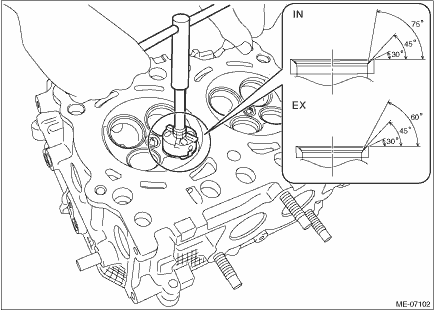 (1) Clean the valve and valve seat. 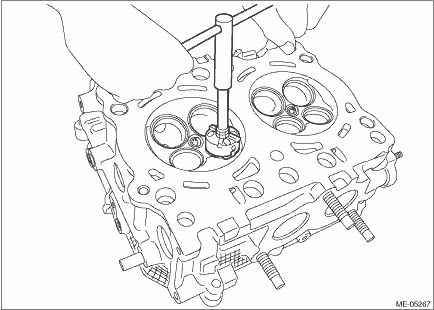 (2) Coat the stem (A) of the valve lightly with engine oil and apply red dye evenly on the valve face (B). (3) Using the valve lapper, slowly insert the valve with red dye applied into the valve guide. Lightly press the valve against the valve seat without turning the valve, and then slowly pull out the valve. 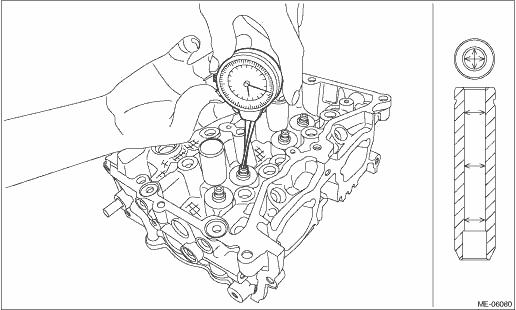 (4) Check the seating width “W” of valve seat as shown in the figure, using a caliper gauge. Check the seating width “W” between valve and valve seat by measuring the width of red dye on the seating surface of valve seat. If the seating width “W” between valve and valve seat is out of the standard, correct the seating surface of valve seat using the valve seat cutter. 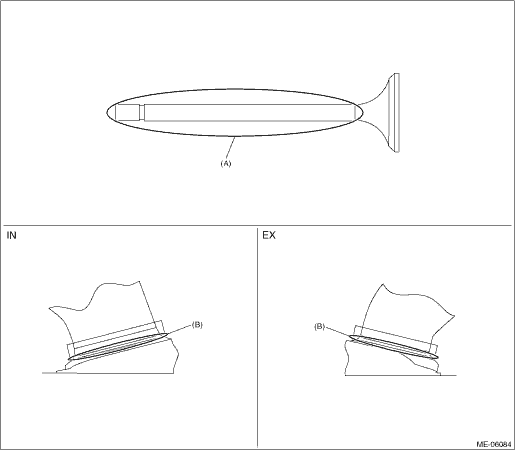 For correcting procedures of the valve seat seating surface, refer to step 3). • When the red dye does not appear seamlessly on the valve seat seating surface, lap the valve. For lapping procedure, refer to step 4). • When the red dye does not appear seamlessly on the valve seat seating surface even after lapping the valve, correct the valve seat seating surface using the valve seat cutter. 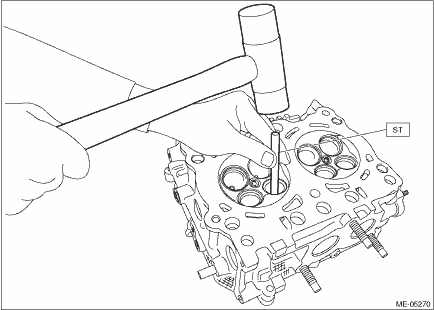 For correcting procedures of the valve seat seating surface, refer to step 3). (5) Wipe off the red dye on the valve and valve seat completely. (6) Coat the stem (A) of the valve lightly with engine oil and apply red dye evenly on the seating surface (B) between valve and valve seat. (7) Using the valve lapper, slowly insert the valve into the valve guide. Lightly press the valve against the valve seat without turning the valve, and then slowly pull out the valve. (8) Check the seating position between valve and valve seat. Check the seating position between valve and valve seat by checking the position of red dye on the valve face. If the seating position between valve and valve seat is not at the center of valve face, correct the seating surface of valve seat using the valve seat cutter. 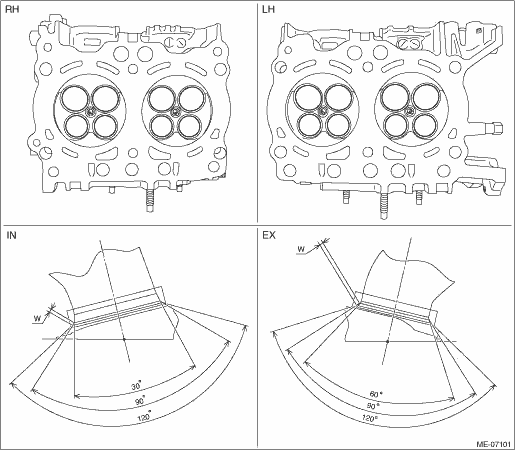 For correcting procedures of the valve seat seating surface, refer to step 3). (9) After inspection, wipe off the red dye completely. (1) Correct the seating angle between valve and valve seat using the 45&#x00B0; valve seat cutter. • Grind the seating surface so that the seating width between valve and valve seat becomes slightly larger than the standard value. • Gradually reduce pressure at the end of grinding process in order to avoid creating a gap on the valve seat correcting surface. (2) Lap the valve. For lapping procedure of the valve, refer to step 4). (3) Check the seating position between valve and valve seat. 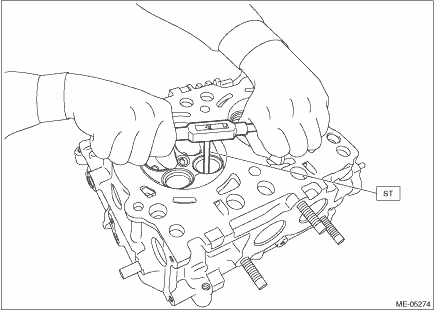 For inspection of the seating position between valve and valve seat, refer to step 2). This procedure is necessary to select a seat cutter to be used in step (4). (4) Using a seat cutter, correct the valve seat so that the seating width between valve and valve seat becomes the standard value. • Select a proper valve seat cutter according to the following table. When the seating position of valve face is high, grind the surface using the 30&#x00B0; seat cutter until seating width between valve and valve seat becomes the standard value. When the seating position of valve face is low, grind the surface using the 75&#x00B0; (IN) or 60&#x00B0; (EX) seat cutter until seating width between valve and valve seat becomes the standard value. When the seating position of valve face is at center, grind the surface evenly using the 30&#x00B0; and 75&#x00B0; (IN) or 60&#x00B0; (EX) seat cutters until seating width between valve and valve seat becomes the standard value. (5) Lap the valve. 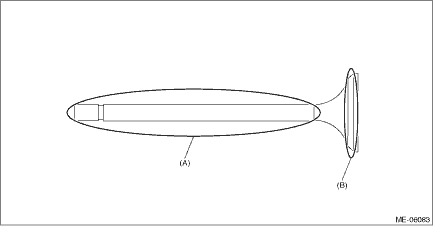 For lapping procedure of the valve, refer to step 4). 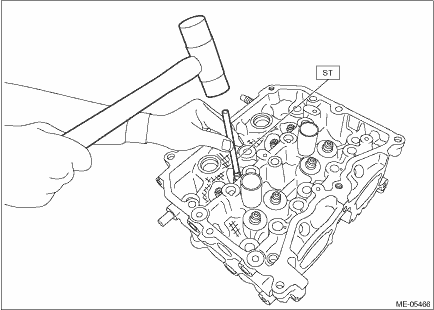 (1) Coat the stem (A) of the valve lightly with engine oil and put a small amount of valve compound evenly on the valve face (B). • Be careful not to put the valve compound more than necessary. • To avoid damaging the valve guide and valve stem, be careful not to let the valve compound contact the valve stem. (2) Using the valve lapper, slowly insert the valve with the valve compound applied into the valve guide, and lap the seating surface between valve and valve seat. First, lift the valve and strike it against the valve seat twice, and then slightly turn the valve once. Repeat these steps as one set. • To prevent the seating width between valve and valve seat from exceeding the standard value, be careful not to keep turning the valve while pressing it against the valve seat during lapping. • Be careful not to lift the valve too far during lapping in order to prevent the valve from coming off the valve guide. (3) Wipe off the valve compound on the valve and valve seat completely after lapping. Be careful not to leave any valve compound in order to avoid malfunction. (4) Check the seating width and seating position between valve and valve seat. 1. Check the valve spring for damage and deformation. 2. Using a caliper gauge, valve spring tester, surface plate and try square, check the valve spring free length, tension/spring height and squareness. If it is not within the standard, replace the valve spring. 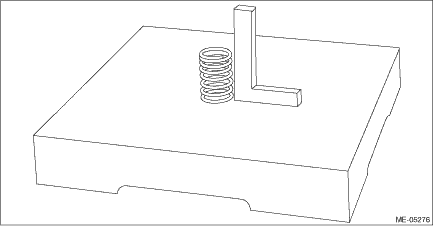 • To check the squareness of the valve spring, stand the valve spring on a surface plate and check its deflection at the top of the valve spring using a try square.